Wedding cakes have become more than just simple white-tiered confections with a bride and groom cake topper; they have transformed into unique creations that include modern design elements and distinct, creative patterns. No matter which trend you prefer, Coborn’s expert cake decorators can provide you with a wedding cake that will meet your expectations. If you’re planning a wedding this spring or summer, be sure to set up a consultation at your local Coborn’s bakery at least four to six months in advance of your big day. When you meet to discuss ideas, bring with you photos, the wedding invitation, color scheme and any other items that reflect your personal style. Whether you prefer a round, square or sheet cake, we can take any trend and create the perfect centerpiece for your special day. Or, if you choose another creative approach instead of a cake, like cupcakes or a donut tower, Coborn’s can help make your dessert unique. Read on to get a taste of some popular wedding trends that may inspire you to create your own picture-perfect wedding cake. Color Scheme: Trending color schemes for these shiny yet elegant wedding cakes are gold, silver, copper, pink and other bright and lively colors. Many glamour cakes possess stunning metallic gold and silver tiers. Metallic can be incorporated subtly throughout the cake, or it can be entirely metallic. Some couples are so in love with this trend that they include metallic fruit toppings as well. Design Elements: Glamour cakes can possess extravagant components or delicate touches. They can feature a variety of fancy flowers, branches, pearls, sugar crystals, beading, sequins and ribbons. These cakes are usually in multiple tiers and each tier can be prepared in a different size and color to give them a glitzier look. 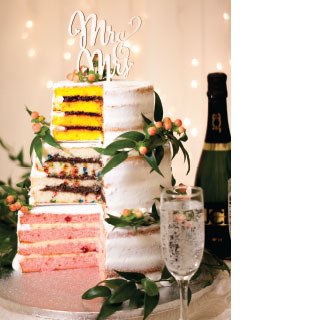 Flavors: A glamour cake can take on many flavors; however, mainstream flavors like red velvet, champagne, coconut, golden almond, buttercream, lemon, strawberry and yellow are most popular. Color Scheme: Layered cakes are comprised of tiers (typically three) that appear the same on the outside, but offer an element of surprise with a different color, flavor and filling for each inside layer. These cakes are often white or a neutral color to allow the distinct colors on the inside to stand out. Design Elements: Flowers and natural elements such as leaves, grape vines or delicate branches are regularly chosen to decorate these cakes. A unique cake topper is a great accent for a layered cake as they tend to have a plain design allowing for a more extravagant finishing touch. Flavors: The flavors in a layered cake can balance one another or they can be distinctly different, giving guests a unique experience when they taste each layer. Try fillings and flavors like yellow cake and vanilla cake with fudge filling or strawberry cake with blueberry filling. Tip from Coborn’s Expert Cake Decorators: Feel free to mix and match your flavors. Each tier can be unique along with any sheet cakes you may order. Set up a consultation with your chosen bakery and ask about our many flavor and filling options. While many couples choose marble since it is considered a crowd-pleaser don’t be afraid to express yourself through your taste buds. 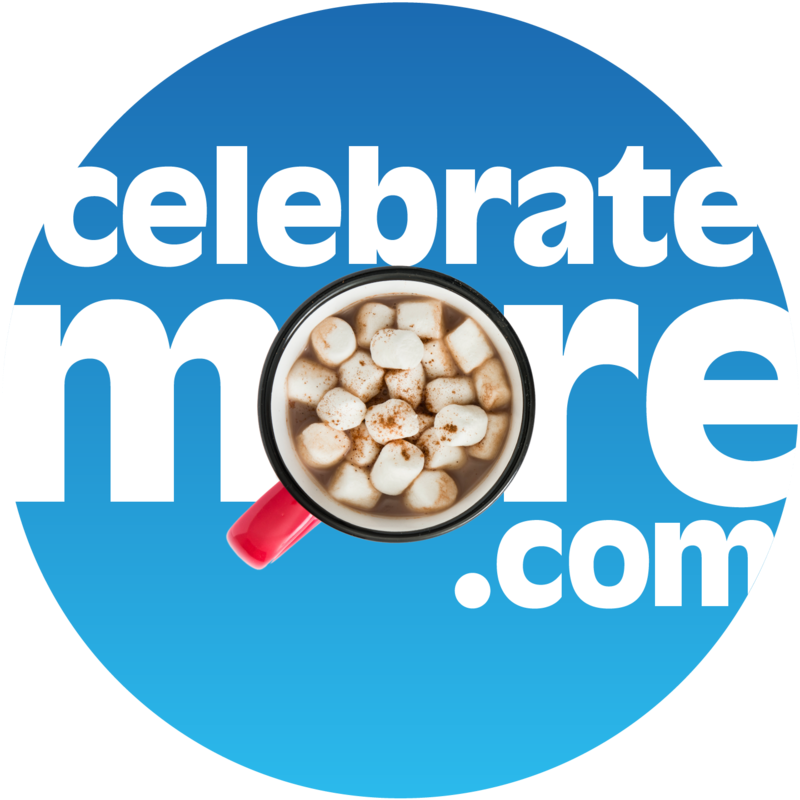 Wouldn’t confetti cake be a fun surprise? Or how about lemon cake to match your yellow flowers? 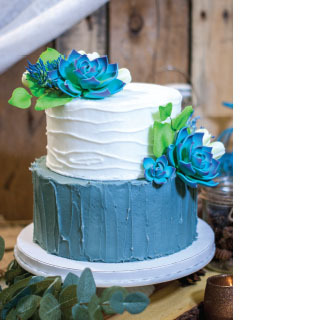 Color Scheme: Boho cakes contain varying natural hues — typically blues, greens and beiges with complementing bright colors such as red or pink. Others may possess an array of eclectic colors and patterns that are inspired by various cultures. 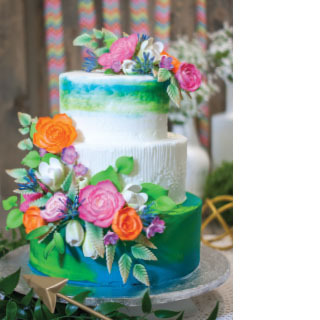 Design Elements: Boho cakes are known for their bold wildflowers, textured frills, vines, leaves, lace and elegant tiers that convey a casual, lighthearted and carefree spirit. These cakes can also include candles, feathers or ethnic designs and beading to add a decadent touch. Some even incorporate flower crowns onto their cakes that are also worn by boho brides. 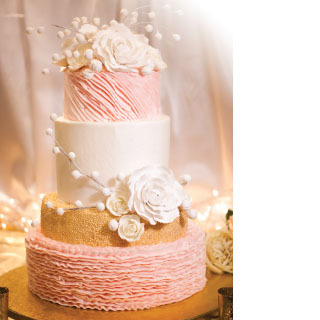 Flavors: Popular boho cake flavors include buttercream, vanilla, marble and carrot cake. Fresh berries can top the cake to complement the buoyant Bohemian spirit. Tip from Coborn’s Expert Cake Decorators: For brides on a budget there are a few cost-saving options. One option is to choose a smaller tiered cake for your wedding party and immediate family members, then order several sheet cakes for your guests. Or, if you have your heart set on a 5-tiered showpiece, consider having a few of the largest tiers be Styrofoam forms instead of cake. The “fake cake” tiers will be added at a discounted price and no one but you and your baker will know. Color Scheme: Common color schemes for rustic wedding cakes include beige, brown, green, blue, copper and hues of red or orange. A rustic cake is best with natural colors that accent the outdoor elements often surrounding the cake. Design Elements: Simple and elegant, rustic cakes incorporate a variety of country-esque elements such as Mason jars, burlap, succulents, lanterns, pinecones, flowers and other natural items. An intriguing way to present these cakes is by placing them on a wooden slab to enhance that country feel. Flavors: Popular rustic cake flavors include chocolate, buttercream, red velvet, carrot, coconut, lemon and warmer flavors like pumpkin spice. Tip from Coborn’s Expert Cake Decorators: Gone are the days of flipping through a book of cakes and picking A, B, or C. While bakeries still have cake books for you to browse we certainly are open to custom designs. Feel free to mix and match sizes and patterns. The best thing you can do is show your decorator the collection of wedding cakes you’ve been putting together. Once we know what you love we can build a cake to suit you and your budget. Also, remember to bring color samples to your consultation for the best color match results.